Joyetech eCom atomizer gathers all the advantages of high voltage, high output and large vapor due to its new atomizer C2 head. It has e-juice capacity of 1.5ml. 3 colors available. 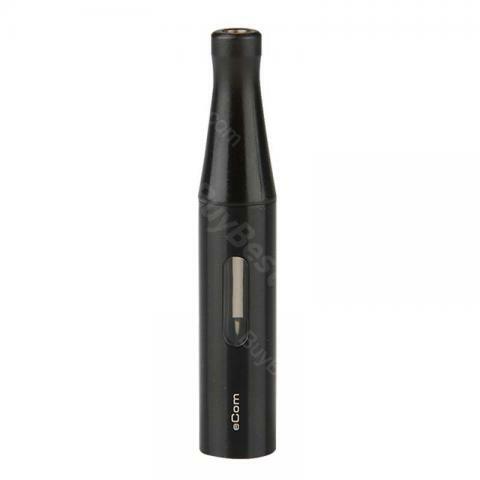 Joyetech eCom Atomizer is the core of eCom. High voltage, high output and large vapor are all available on eCom due to its new atomizer C2 head. It remains the transparent e-juice window. And the upper air inlet and outlet eliminate the likelihood of leakage. • The eCom atomizer comes with unique eCom thread, NOT compatible with 510/ego thread cartomizers or chargers. • No e-liquid included. You can find e-liquid here. • There is CE mark on the atomizer base. What I believe Joyetech has done is to combine the advances of the eVic Supreme and the Delta tank with the sleekness and ease of use of the eCom series. The choice of the Dual Coil C3 atomizer, the same one used in the Delta, and the 1600mAh battery, plus Variable Voltage, clearly shows that Joyetech was aiming at delivering a vape experience to the eCom class that was as close to the eVic Supreme class as they could get. In my opinion, they achieved the best of both worlds. Joyetech eCom Atomizer Tank is a unique 1.5ml capacity tank for eCom kit. It remains the transparent e-juice window. Joyetech eCom Atomizer Tank is a tank with a 1.5ml capacity for eCom kit. It remains the transparent e-juice window. Joyetech eCom Atomizer Tank is a 1.5ml capacity tank made for eCom kit. It remains the transparent e-juice window. Joyetech eCom Atomizer Tank is made for eCom kit. It remains the transparent e-juice window. Joyetech eCom Atomizer Tank is a 1.5ml capacity atomizer tank. It made from stainless steel, glass, and plastic. It has a good air flow control function. It is very healthy and last long with all of its part removable and replaceable. Joyetech eCom Atomizer Tank with a 1.5ml capacity tank for eCom kit. It remains the transparent e-juice window. Joyetech eCom Atomizer Tank is a tank for eCom kit. It remains the transparent e-juice window. New design with perfect fashion. All-glass e-juice window make you be aware of the residual amount of the e-juice. I really like it. Joyetech e-Com Atomizer tank is a 1.5ml capacity tank for eCom kit. with a transparent e-juice window. Joyetech eCom Atomizer Tank is a 1.5ml capacity tank. It is the core of eCom kit. High voltage, high output and large vapor are all available on eCom due to its new atomizer C2 head. It remains the transparent e-juice window. Joyetech eCom Atomizer Tank is a1.5ml capacity tank. Joyetech eCom Atomizer Tank eCom kit. It remains the transparent e-juice window. with a capacity of 1.5ml.